When I want to write and have no ideas for topics, I often turn to visual art, particularly, as I mentioned a while back, Japanese woodblock artists like Hokusai. 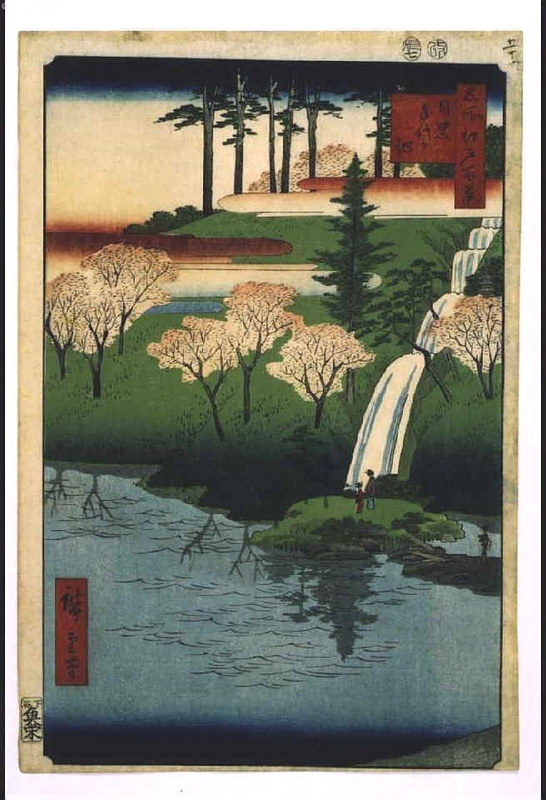 A few days ago, as I was digging through old journals that I was published in, I found a poem I had forgotten about that was based on one of Hiroshige’s pictures that I could not remember. So I went and dug up my Hiroshige books, couldn’t find it and so, of course, requested some books from the library. And I fell in love again. Ando Hiroshige (1797-1858) worked part-time for many years as a firefighter at Edo Castle, so those of us who are artists with day jobs shouldn’t feel too alone! Greatly influenced by Hokusai, whose landscapes were wildly popular, Hiroshige produced Thirty-six Views of Mount Fuji and Fifty-three Stations of the Tokaido Road, but it is the series One Hundred Famous Views of Edo, that he did towards the end of his life, that I like best. (Edo is the old name for Tokyo.) In this series, he used bright colors and vertical orientation, often with some larger piece of what I would normally think of as background in the foreground and large, like a tree branch or a banner, so that you have to look harder to see the people and figure out the story that is playing out. The following poem appeared in Ekphrasis and was nominated for Pushcart Prize XXIII: Best of the Small Presses in 1997.
pinning them with pointed lacquer hopes. of love for her husband, killed in battle. These cherry trees did not grow here back then. Night comes, soon enough, we disappear. have lost, you think, your future blossoming. Why not, you ask me, simply float and fade? clear white and frothing as the very day. to wash out expectations, not drown hope. somewhere, teeth flashing, not knowing he waits. but throw yourself, my daughter, into life. Spilecki, Susan. “The Mother Takes Her Teenage Daughter to Chiyo’s Pond,” Ekphrasis (1997) 1:1. This entry was posted in inspiration and tagged Ekphrasis, Hiroshige, Hokusai, Pushcart Prize, ukiyoe, woodblock art. Really lovely – some of your metaphors just stabbed me in the heart. I always find Japanese art so calming and tranquil – almost as though you can hear the trees swaying in the breeze and hear the water running in the stream. Exactly. It reaches a part of me that would otherwise go unnoticed and underappreciated.